" There is a growing Bed bugs Seattle crisis according to Clay Thompson from the Seattle Department of Planning and Development (DPD). Reports of bed bugs include incidents at buildings managed by the Seattle Housing Authority such as the Ball Tower and Denny Terrace. While the size of the problem in Seattle has not been documented, one major pest control company based in the area indicated that their bed bug related call volume increased from 1call a month to over 24 a month at 1 pest control company location." The Number of bedbug-related complaints continues to rise across the world, and Seattle is no exception. Bedbug pest control experts in the Seattle area are seeing an exponential increase in bed bug related calls with one mentioning call counts as high as 24 per month, up from 1, 2 to 3 years ago. For example, 1/3 of the apartments at the Denny Terrace have been treated for bed bugs. Bed bugs must be carried to any location. Usually they are picked up by travelers. When the traveler returns, the bed bugs leave their hiding place, and enter the home. If you live in an apartment building, their is a 7% to 20% chance, that they can move from an infested apartment to an adjacent apartment (next door, above or below). Seattle residents are covered by local ordinances and state ordinances that govern landlord tenant relationships. In general, the law indicates that landlords are required to control insect infestations, however, based on our interpretation, it does not describe who pays for treatment. This does not mean that a landlord will not pay, it just means that you have to confirm that they will. After all, it is in the landlords best interest to keep an infestation from spreading through a building. In terms of the city of Seattle, the law specifically states that a landlord is required to control insects and other pests. There is also a Washington State law that states that a landlord is obligated to control pests before a tenant starts a lease and moves into an apartment. State law indicates that a landlord must continue to control infestations except in single family homes or when an infestation is caused by a tenant. Unfortunately the law does not specifically state that landlords or building managers must pay for treatment. Clarify this issue before requesting treatment. In government or public housing the city of Seattle will pay (always ask). 1. Call the City of Seattle Department of Planning and Development at (206) 615-0808. Ask them to explain your rights as a tenant. 2. Send a dated letter to your building manager or landlord requesting treatment. State that you did not bring the bed bugs into the building and that all adjacent units should be inspected. A dated letter serves as legal notification. Send it signature requested so that you have proof that it was received. 3. If a landlord refuses to treat a Seattle bed bugs problem, or wants to charge you for treatment, contact a lawyer that specializes in landlord tenant issues. Organize a meeting of tenants that live next door, over and below your unit, as these are the tenants that are most at risk for bed bugs. Work with a lawyer to organize your next steps such as withholding of rent in an escrow account. If required, you can get a free quote for treatment from Service Magic (call 1.877.233.1145). This can be helpful, particularly if you need to split the cost of treatment with the landlord (often the best way to go when the law isn't clear). Here is a summary of Seattle landlord/tenant laws. While waiting for bed bugs Seattle treatment you can follow the steps below to reduce the size of the infestation in your apartment. Note that without inspecting apartments under, above and next door to yours, the infestation will probably return in 2 to 3 weeks as the insects work there way through the walls back to your apartment. If you live in an apartment building and you believe that you have bed bugs, be sure to contact your building manager, condo or co-op association. If you are a home owner, and you believe the infestation are in its earliest stages, you can try a do it yourself approach, although a pest control professional is preferred. You can opt for a professional inspection first from a company in the Seattle area such as Trek Inspection Services. 1. Vacuum the Room, Wash all Linens/Blankets - You'll find up to 85% of bed bugs near the bed. Be sure to vacuum all areas, check all objects and bag anything that can be carried to a washing machine and cleaned. Use bags which are bed bug proof such as Ziploc Double Zipper Big Bags. Wash using hot water and 20 minutes in the dryer. 2. Treat - Use mattress safe bed bug sprays on all surfaces. Purchase a product like Sterifab to knock down or kill bed bugs on contact. This product in particular has passed independent tests showing that it kills insecticide resistant bed bugs. Treat all surfaces including seams and behind the mattress and box spring labels. Peel back the box spring cloth on the bottom of the box spring and treat inside and outside. Purchase another spray that is designed for cracks and crevices such as Bedlam. The most economical approach is to purchase all products needed in a kit such as the New York Bed Bug Kit. After treating the mattress move it to a safe area just outside the room. Do the same with box spring. Inspect and treat all furniture, around picture frames, bed frame, head board etc. Open a window to avoid the formation of mold from the dampness after spraying. Bed bugs can even hide inside electronics. They are difficult to clean and may have to be thrown out. An alternative is to use heat such as a Packtite container, which heats to the required 114F. 4. Dust - Use a natural fossil dust. Spread around the room. It will kill bedbugs that come in contact with the dust. It is perfect for killing late hatching bed bugs. Bed bug dust is a natural product. 5. Seal the Mattress - Buy a zippered bed bug mattress cover and box spring cover (must say on the label) to trap any bed bugs and bed bug eggs that are still in or around the mattress such as this one offered by Amazon.com. If you have carpet, beside vacuuming consider using a carpet cleaner mixed with a strong disinfectant such as PuraCleenRX to kill any eggs. Test an area of the carpet to avoid discoloring. When disposing of any item that contains bed bugs make sure it is sealed and marked with a sign warning others not to take these items and re-use them. This is particularly the case when disposing of furniture or a mattress so that the bed bugs Seattle problem doesn't get any worse. 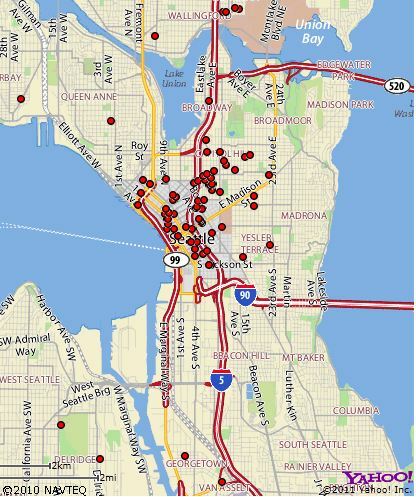 To see if the Seattle apartment or hotel you are planning to stay in have a had a bed bug problem see the site Bed Bug Registry. Just enter the name of the hotel or an apartment address. When hiring a bed bugs Seattle experienced pest control company, part of the challenge is knowing where to look. It pays to get several quotes since treatment can be expensive. One reputable pest inspection service in the Seattle area is Trek Inspection services. If the inspection service confirms the presence of bed bugs you can get up to 3 free quotes from Service Magic (or call 1.877.233.1145) It's Quick, Free, and Easy! You can search our database of Seattle bed bugs pest control experts, a helpful resource when fighting a bed bugs Seattle problem.